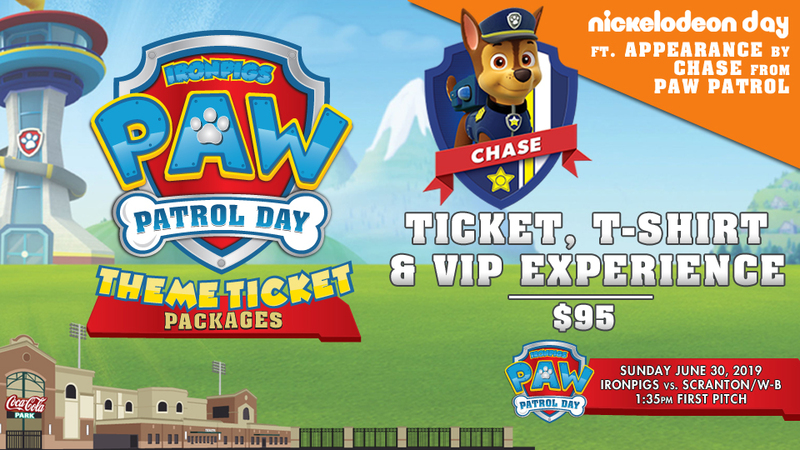 The Lehigh Valley IronPigs have announced that their Sunday, June 30, 2019 contest against the Scranton/Wilkes-Barre RailRiders will be Nickelodeon Day at Coca-Cola Park featuring Chase from Paw Patrol. The team has made a special VIP package available featuring a ticket to the June 30 contest, an IronPigs/Paw Patrol T-Shirt and a special VIP experience (including a photo opportunity with Chase) for just $95. Click here to purchase yours today! This special package is limited to just 75 guests and is the only way to guarantee a meeting with Chase on June 30. After purchasing your seats, a member of our team will reach out to confirm the desired shirt sizes. Please note that all persons attending the VIP session will need a special VIP ticket for admission. In addition to this Nickelodeon Day special, the IronPigs have a number of 2019 Bacon, USA ticket plans available for the 2019 season. Choose from 9-, 10-, 17-, 35- and 70-game options today. Click here or call us at (610) 841-PIGS x3 to secure your seats for 2019 and take advantage of great Bacon, USA benefits like discounts on parking and merchandise and invitations to members-only events. Individual IronPigs tickets will go on sale as part of the team's Pig Day celebration on Saturday, March 2, 2019.